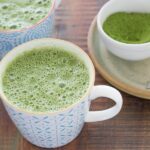 Add the matcha powder to your mug or cup, next add the boiling water, whisking until you break up the clumps. Then add the sweetener and macadamia milk, stir well and enjoy. Add matcha powder, sweetener and warmed macadamia milk to a blender. Blend for 20 seconds and enjoy. Note: you don’t need the boiling water for the super quick method.